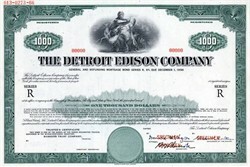 Beautiful specimen bond certificate from the The Detriot Edison Company issued in 1966. This historic document was printed by the American Banknote Company and has an ornate border around it with a vignette of a Greek goddess sitting atop an electric generator. This item has the printed signatures of the Company's President, and Secretary, and Chairman of the Board is over 48 years old.